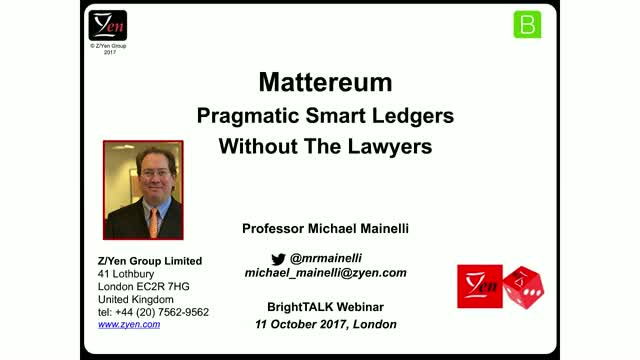 Much has been written about the power and scope of Smart Ledgers and Mutual Distributed Ledgers (MDLs, aka blockchains). Amidst the rush to find new applications for this versatile, ‘trustless’ technology, people overlook the challenge of governing Smart Ledger networks. Governance provides the mechanisms required to balance accountability of the governing body and its duty of meeting the specific objectives of the organisation. Effective governance of Smart Ledgers should answer four critical questions - How are rules created for the ledger and who oversees their application? What happens in the case of dispute? Who is allowed to change the software application and the data? How are security, risk and performance managed and reported? One approach is to embed these questions in existing legal structures, another to try to remain outside, but a third is to explore the appropriate role of arbitration, mediation, and expert determination, as far as possible avoiding enmeshing novel identity, document, and agreement exchanges within traditional legal structures. In this webinar, Professor Michael Mainelli will share research from the Mattereum initiative as well as Long Finance research sponsored by the Cardano Foundation. He will conclude that, while there is nothing new under the sun, Smart Ledgers may need to shift the balance of power from law, to code, to human wisdom.